Something happened the other day. I realized just how messy my home has become with all of this blogging brouhaha. My Mimmie says I’m being ridiculous and that anything that takes my mind off of the things an OCD does to a person (like cleaning the baseboards twice a week like I used to) is a good thing for me. And that my “filthy” is equivalent to other people’s “need to pick up a bit”. But one thing that I just cannot abide letting slide (ooh, that rhymed!) is organization. Mostly because when things get disorganized I can’t find them. And when I can’t find them I get anxious and upset. Then I tear things apart trying to find the thing, only making the situation much worse for myself. Now you may ask, why don’t you just not do that? And it’s not that simple. So it’s easier for me to keep things in a good and orderly manner to prevent me from getting to that totally irrational crying over the lost furminator place. This was bad for a more reasons than the obvious. First of all it was poorly planned. One second I had a treat jar in my hand and the next I had a tub full of water and fingernail polish. Now it seemed like fate because ages ago I had cut some bones out of vinyl and never used them. This just had to be. But I didn’t think about the sheer quantity of fingernail polish I’d be dealing with and started this in my office. With the windows closed. And I don’t know what it is, but you don’t realize that something is wrong until you are at the point that you realize that it is really wrong. Needless to say, when I was first finished I thought it was a masterpiece and I took photos and edited them. Shazaaam! And when I noticed it later I was like, this is no good. I must go and purchase new canisters to fix this… And so the pantry is still a mess. But Aggie’s got a super cut and colorful canister! Canisters <– cheaper at Wal-Mart! Measure your jar and cut your bones out to the shape that will best fit. For mine it was four inches across exactly. Either cut out of contact paper or vinyl by hand using this image as a guide or on your Silhouette machine. Using your masking tape cover the entire bottom including where the glass makes contact with the table. We’re going to tape this area off because if we don’t you could have paint rub off onto your tabletops. To get a nice clean shape on the bottom, take a razor blade and make the shape you want keeping in mind that you need to keep the areas that make contact with flat surfaces are well masked. Tape off the lip and stuff a plastic bag into the top and get to spraying! I plan on making a whole lot of these in different, bright colors. There will be one for cat treats and another for cat toys. And to be honest, I love this one so much I’m planning on making some for my kitchen counter-tops as well! I also love that these guys are attractive looking, but I can still easily see inside to know when I need to pick up more treats because I’m running low! Before you go, guess what!? I made this project mostly because I get easily sidetracked but also for my Silhouette Challenge for April themed Spring! 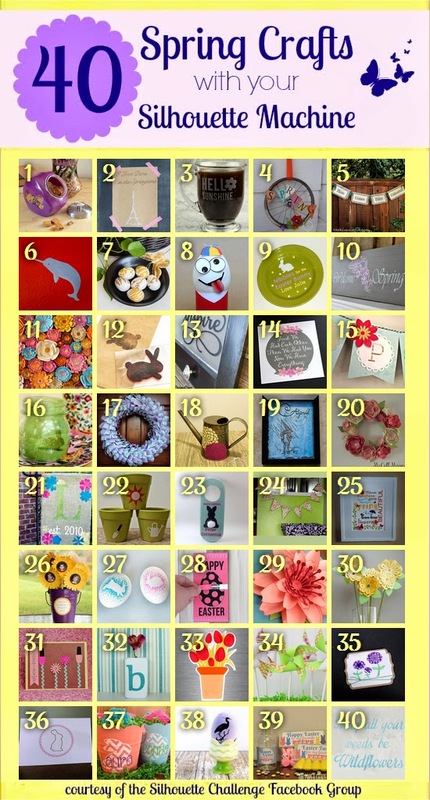 So scroll on down and check out some amazing Silhouette projects from some lovely bloggers below! How cute! I need something like this to keep my pups treats in! I love these containers for treats. I think my cats would love them too! Stopping by as another Silhouette Challenge blogger! The spray paint almost looks like shrink wrap! Way cool! Nice work lady! I love this project! What a fun way to add a simple blast of color to the cupboard. What a great idea! This would make a great gift for the animal lovers in the family! LOVE!! My little pup totally needs a fun-colored treat canister now! Oh, and I totally hear you on getting irrationally frustrated over disorganized spaces AND getting completely sidetracked by random projects :) I find myself in both of those situations quite frequently! These are so cute! I love the dog treats container! We have so many treat bags crowding our kitchen! (My car is very picky) We may need to do this! Love that you are taking care of a ferral. It shows your big heart! I actually have no doubt your brain scans would blow us all away with your brilliance and creativity…but who needs brain scans to see that when we have the Dream a Little Bigger archives?! ;-) Another fab creation, Allison. 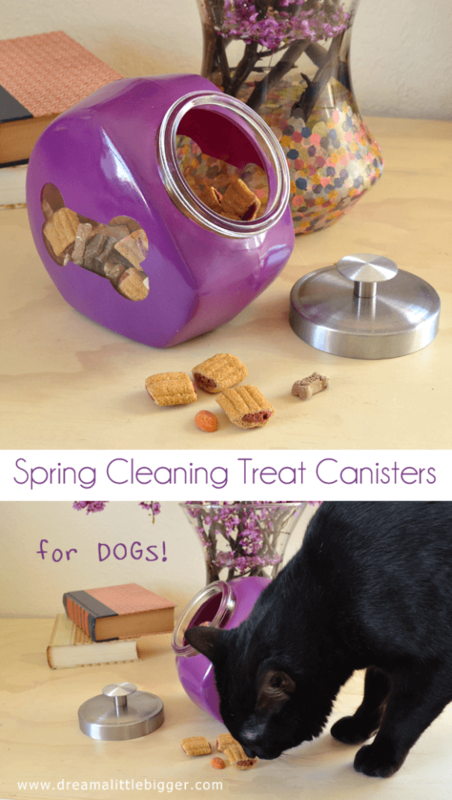 I love the use of the negative space to see the treats inside…. Your kitties are so loved! Very clever technique I can see lots of applications for. Thanks for sharing! These turned out great! I hear you about organizing! We got two kittens last fall and kitty things were piling up in different areas around my home, so I made a designated storage tote for storing all the kitty things including their flea meds.